What’s different about this fried chicken, versus the many good ones that abound in New York City? Well, Delaney believes in dipping his boneless chicken thighs in a seasoned wet batter before frying it up. This results in an airier crust that gives the chicken a whole different texture. 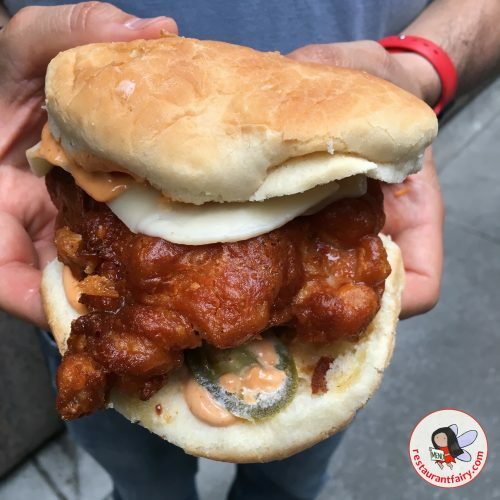 This piping hot, crispy chicken is then placed in a buttered potato roll and dressed up with pickles, Crystal hot sauce and Duke’s Mayonnaise. All of this makes the fried chicken sandwich at Delaney’s rather desirable. Do go try it. 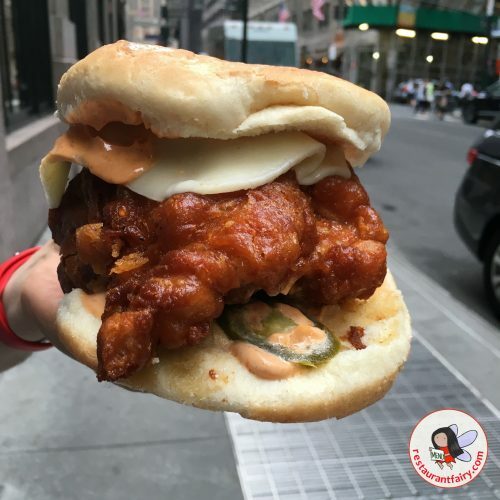 This entry was posted in AMERICAN, CUISINES, MANHATTAN, Midtown East, Midtown West, NEW YORK, NEW YORK CITY and tagged best fried chicken in brooklyn, best fried chicken in new york city, delaneys chicken sandwich, Fried chicken sandwich. Bookmark the permalink.